Clean, condition and protect your leather, vinyl and plastics! 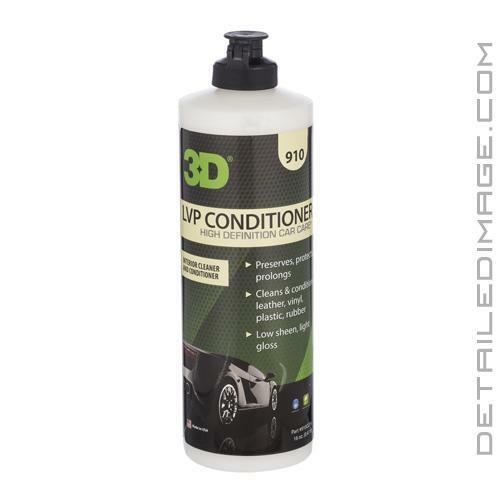 The 3D LVP Conditioner cleans, conditions, and protects leather, vinyl, and plastic in one easy to use product! The secret behind LVP is that it is made with mink-oil, which helps add extra softness and extend the life of various surfaces. To apply, saturate an applicator pad with LVP and massage into the surface. Let the product sit for a few minutes and wipe off the excess with a clean microfiber towel. LVP cleans dirt and grime away from leather, vinyl, and plastic, while the mink-oil conditions and helps protect from harmful UV rays. Best of all the surface looks great and there is no greasy residue. Use LVP on your leather seats, dashboard, interior vinyl, and plastics. 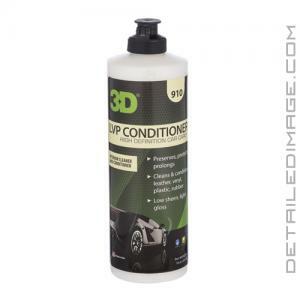 Tackle CCP (Cleaning, Conditioning, and Protecting) of your leather, vinyl, and plastics with the 3D LVP Conditioner! DO NOT USE ON UNTREATED LEATHER - SHAKE WELL before use. Apply a small amount to a clean, damp cloth or applicator. Using circular motion, massage and apply the product to leather or vinyl until the surface is fully covered. Buff off excess with a clean microfiber towel. NOTE: If leather is very soiled, make sure to pre-clean the surface with 3D's LVP Cleaner diluted 1:10 parts water.